Shuffle is a collaborative project I created with a fellow designer during my second year at CMU. The goal of the project is to create a system that can become an element of the "Design Studio of the Future." My partner and I decided to create a prototyping software that merges the physical and digital worlds of modeling. This merging allows for more informed design decisions and offers a clearer spatial image for the designer. Alex and I used several different physical and digital space prototyping methods that already existed. This helped us to better understand the limitations that users currently have and how our hybrid model might offer them more flexibility (modeled in SketchUp; created by Alex Palatucci and Gillan Johnson). Before we created Shuffle, Alex and I explored our own studio space during an exercise that required us to reconfigure the studio in a way that was beneficial to all students and teachers, as well as conducive to both individual and collaborative work. We moved the desks around multiple times to see what the reactions and issues were for people in terms of moving around, visibility, privacy, etc. After several iterations we successfully created a configuration that worked well for everyone in the room. We worked on a grid system which we laid out on the velcro wall. While working with this method, we realized how easy it was to make quick iterations of desk layouts and take photographs of them. Through this rapid prototyping, we realized how crucial physical prototyping is to our concept for designing a “studio space of the future,” as we did not want our concept to rely fully on digital or VR technology. Our solution is an integration of these two worlds of prototyping, which offer designers more flexibility in their prototyping. 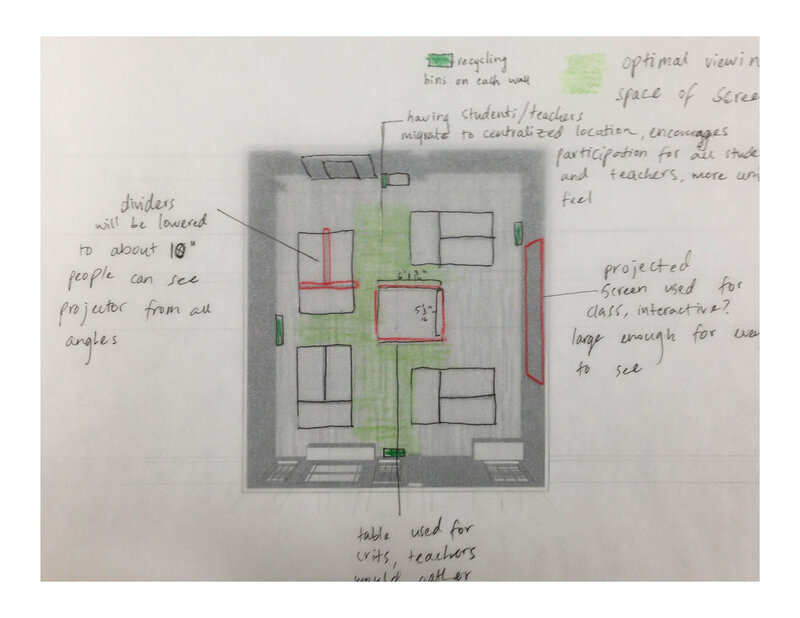 After we explored different ways of reconfiguring the space (drawing, SketchUp, physical movement of desks, etc.) we eventually decided that a way to facilitate this process, or finding a way that combines all of these methods, would be a great basis for our “studio of the future” project, so we decided to continue with this concept of studio redesign and eventually created Shuffle. Alex and I decided to play around with more hands-on modeling, so we worked with paper models of the studio desks, tape, and velcro. The digital component of Shuffle consisted of the grid layouts of the room, previous iterations that can be referenced later, and different viewing angles that one can click through to see various vantage points within the room. The digital features are incredibly useful for seeing pathways through the room and predicting where the flow of traffic is most likely to occur. Since we see Shuffle as a tool that facilitates collaboration on space design, we needed it to be flexible for sharing and uploading from multiple platforms and on multiple devices. The 3D perspective viewing tool helps the user to understand the space more holistically; it bridges the physical and digital aspects of Shuffle and clarifies the opportunities and obstacles that designers may encounter.